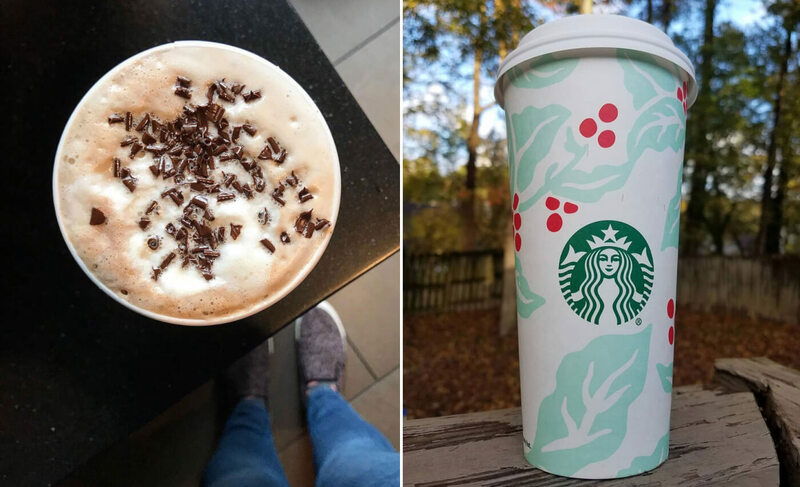 Getting into the holiday spirit is easy, thanks to vegan holiday Starbucks drinks. The festive limited-time lineup just hit stores nationwide, and we have your handy guide to ordering them vegan. It wouldn’t be Christmas without Starbucks’ spicy-sweet Christmas Blend coffee. Enjoy it black, or spice things up with a splash of almond milk, a pump of vanilla syrup, or a dash of cinnamon. Is there anything more cheerful than a peppermint mocha during the holidays? Request almond, soy, or coconut milk, and be sure to hold the whipped cream. Opting for nondairy milk and no whipped cream will make Starbucks’ gingerbread latte—a favorite of many—vegan. The nutmeg, gingerbread, and warm spices make for a delicious way to get in the holiday mood. How good does an espresso with steamed nondairy milk, caramelized chestnut flavoring, and mulled praline crumbs sound? Request that yours be made without whipped cream—and voilà, you’ve got a delicious vegan Chestnut Praline Latte! For those who aren’t crazy for coffee, opt for Starbucks’ Toffee Almondmilk Hot Cocoa. The best part about this drink is that it’s already made with vegan almond milk! Just be sure to specify no whipped cream. Aside from the Christmas Blend coffee, any of the above can be ordered hot, iced, or as a Frappuccino. Steer clear of the Toasted White Chocolate Mocha, Caramel Brulée Latte, and Eggnog Latte, which are made using syrups and other ingredients that contain dairy ingredients. While Starbucks doesn’t currently offer vegan holiday-specific food items in its U.S. stores, there are tons of year-round eats to choose from. To see a complete list, check out our Starbucks Vegan Food Guide now, and enter your e-mail address below to have even more helpful vegan tips sent directly to your inbox.